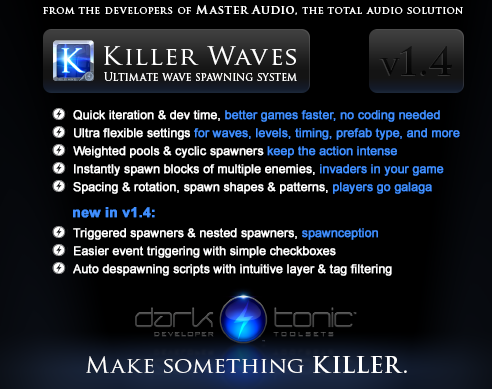 Dark Tonic Games Studio: Killer Waves for Unity 3D ... for free? Killer Waves for Unity 3D ... for free? Did you know Killer Waves Lite is completely free on the Unity 3D asset store? It contains the core components of the full Killer Waves suite, the total solution for enemy spawner and wave setup that gets your game up and running in minutes. And check out the Killer Waves tutorial videos for a quick how-to!